1) Mix all the ingredients of marinate and marinate the chicken at least for 2 hours. 2) In pan add about 1 table spoon of butter or ghee and saute the marinated chicken for couple of min. Cover the pan and let the chicken cook on slow flame. The required consistencey of the chicken for this recipe is of curry not soupy. 1) Wash rice with water, rinse and keep aside for 2 hours. 2) Heat oil or ghee in the pan. 3) Add bayleaf,cumin,cinamon stick,cardamoms and rice. 4) Add 3 cups of hot water and enough salt to the rice. 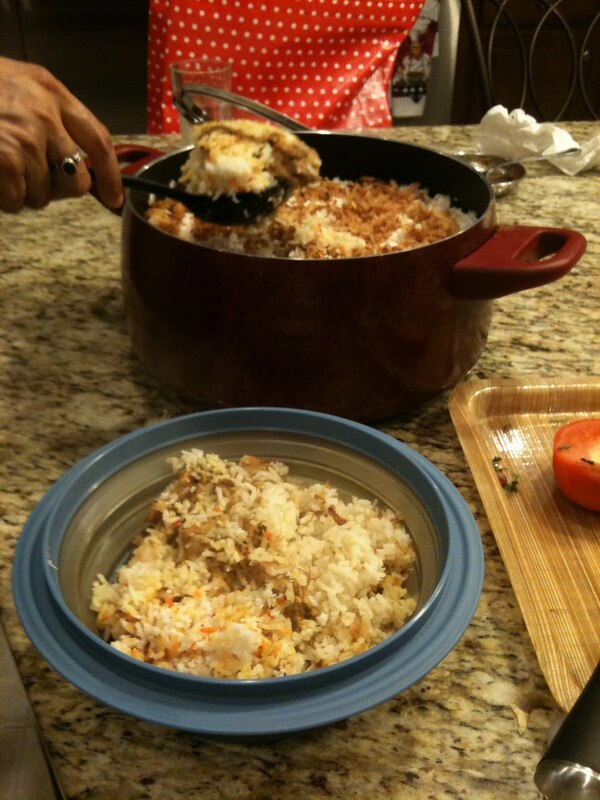 6) Split the rice in two parts in two diffrent plates. 1) In the heavy bottom container add oil adnd layers of onions. 5) Layer of deep fried onions,cashews and raisins. 6) Make little holes in the layered rice and pour ghee or butter in it..